I asked for maintenance/tune up on a four-year-old garage door. There was NEVER a push to sell me something I didn't need. Arnold was very professional and knowledgeable about the work that needed to be done. The door is now opening and closing smoothly. 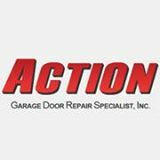 I'll be calling Action for any and all future garage door needs I have. Great service did the job in less than 1 hour.I recommend this garaged company.Thanks to technician Allen. Great service. A little pricey.